Kathmandu–Prime Minister KP Sharma Oli has said the Communist Party of Nepal (CPN) led by Netra Bikram Chand 'Biplav' would be brought into the political mainstream by April 13. Addressing to the Nepal Communist Party (NCP) lawmakers of the House of Representatives and the National Assembly at the Parliament Building, Naya Basneshwar, today, he said the Biplav group would be brought to the mainstream of politics by putting to an end its extremist and violent activities. "The group would be brought into political mainstream politically if possible and if not even by putting 'the phony comrade' behind bars," PM said. Accusing the Biplav group of trying to make the present communist-led government a failure, undermining the democracy, sabotaging the development works and obstructing the government-targeted socialism, PM Oli said that that cannot happen. "They will come to the political mainstream adopting flexibility, if not even by imprisoning them." He said although they showed tolerance towards Biplav's group taking them as (fellow) communists, the group instead mobilized its cadres to assassinate the NCP leader. The Prime Minister claimed that secessionism has been banished from the country and it would now move forward on the basis of national unity. He stated that the government has started holding discussions with all sides and bringing them to a compromise for concluding the peace process at the earliest. 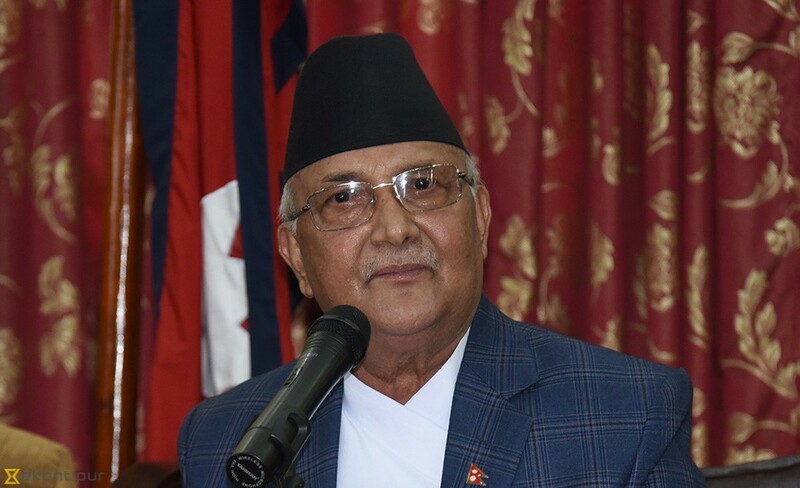 "The remaining works of the peace process should not be delayed any longer now so as to allow 'some elements' to play in it," PM Oli said, adding that the peace process would now be concluded in an appropriate way as the legal framework was already ready. He informed the party lawmakers that the meeting of the Council of Ministers scheduled for later today would constitute a recommendation committee to recommend names of office-bearers to the two commissions – the Truth and Reconciliation Commission and the Commission of Investigation on Enforced Disappeared Persons (CIEDP) – tasked with concluding the peace process. Stating that the government was actually becoming successful and taking the country up the ladder of prosperity, he urged the Members of Parliament to publicize the good works carried out by the government in their respective constituencies. He called on the MPs to publicize the good works of the government among the people in the districts and the constituencies, and to flay the baseless accusation leveled by the opposition. "You people go to your districts and constituencies. Publicize about the works carried out by the government. The people have been misled (by the opposition) by propagating the untrue things while hiding the achievements made by the government from them," he said, and urged the MPs to tell the truth to the people and listen to them. Return to Kathmandu along with the details of plans and budget for the policy and programme for the next year, the PM said. He asked them to bring the plan of development works from the districts by coordinating with the State and local governments, and to submit the same to the NCP parliamentary party or to the minister concerned. Noting that the government has started to formulate the development goals for 25 years, he urged the lawmakers to bring plans from the districts taking this into consideration. PM added that the format of the government's policy and programme, and budget would be in line with the federal set-up. He expressed that the government was committed to bringing socialism in the country as the whole world was gradually moving towards socialism. Our socialism would be socialism with justice, he stressed. Also the NCP chair, PM Oli said the party unification would be concluded at the earliest. "The unification of all units of the party organization should have actually been unified by now but we have not been able to do so even after 10 months of the party unification. Now, we are going to conclude the party unification very soon. We will conclude this soon after another party chair Pushpa Kamal Dahal 'Prachanda' returns home from America," he added. On a different note, PM said the Nepal Investment Summit going to be held in Kathmandu on March 29 and 30 would take place in an enthusiastic manner.